I get a lot of folks asking me how to start a podcast knowing that I am the co-host and producer of the Curbside Car Show podcast. When I first started that podcast I wanted a simple set of steps to get me from wannabe to podcaster. Since I couldn’t find those, I’ve created them. As of 2019 it is estimated that there are over half a million podcasts available and that about half the US households are aware of them and have listened to a podcast. Podcast listeners tend to be loyal, affluent and intelligent. So, clearly, there is a great audience potential. Here’s a website with podcast statistics. With that many podcasts you might wonder if the field is approaching the “full” mark but there are millions of blogs and I still think it’s good to start one - there is still opportunity there. A podcast is a spoken word audio or video program sort of like a radio show that people download on their phones and listen to at their leisure. Typically there’s value delivered to the listener but there are also fun podcasts that are purely entertainment as well. The term came from Apple’s iPod devices where you could download these programs to the iPod. Nowadays we’re all downloading them to the smart phones that are in everyone’s pocket. Podcasts are generally free to the listener/viewer so the opportunity to profit from your podcast has to come from somewhere else. Advertising on the podcast is one way to do it but, if you’re ultimately selling something about which you’re podcasting, then that might be the motivation. In my case the objective is to get folks onto my website where the advertising is. Unlike a radio program a podcast doesn’t have a specific length it has to be. If you have a lot to say one week or one month you can fill a lot of time. If your next subject has less material, that episode can be shorter. There’s no time frame requirement which is another plus. If you’re a bit nerdy with computers, especially audio and visual files and systems, this will be a breeze. If this is new to you you can still produce a podcast but the sound quality may not match that of the bigger companies doing that. Still you can get some pretty spectacular results with a little knowledge and some cheap software and a decent microphone. Essentially a podcast is a digital recording that has to be stored somewhere where it can be distributed to the world. There are a number of companies who offer this service that do a great job at a really fair price. From this stored file you will then need distribution and Apple is still the big daddy rabbit in the game, though Spotify and several others look like they’re coming up the ranks. My favorite hosting company is called Libsyn (Liberated Syndication) where I post my podcast each week and they make it available for distribution. From your podcasts place on Libsyn’s computers it can then gets distributed to eagerly awaiting world. If you want to be on Apple’s podcast platform, and you do, you will also need to establish a free account over there. Apple’s website for podcast distribution is podcastconnect.apple.com. Before you sign-up there you’ll want to sign-up with Libsyn and have something to feed the Apple account. Apple has very specific requirements about titles and icons so follow these to the letter. For example, they recently took action on their ban of episode and show numbers from titles. Follow their rules. You can also sign-up with Spotify at podcaster.spotify.com. Libsyn also has a portal to Spotify so you can access it there. You’re going to have to know how to upload an MP3 file to Libsyn and then tell Apple where those podcasts are. Libsyn provides an RSS (Really Simple Syndication) feed and you point Apple to this. This is basic computer stuff; however, it’s also a bit convoluted. Plus Apple has to approve your podcast and has specific rules for distribution and such. Many’s a podcaster who submitted a podcast to Apple only to get a cryptic denial back which turned out to simply be an improperly-sized icon. This was me. Apple offers zero support. 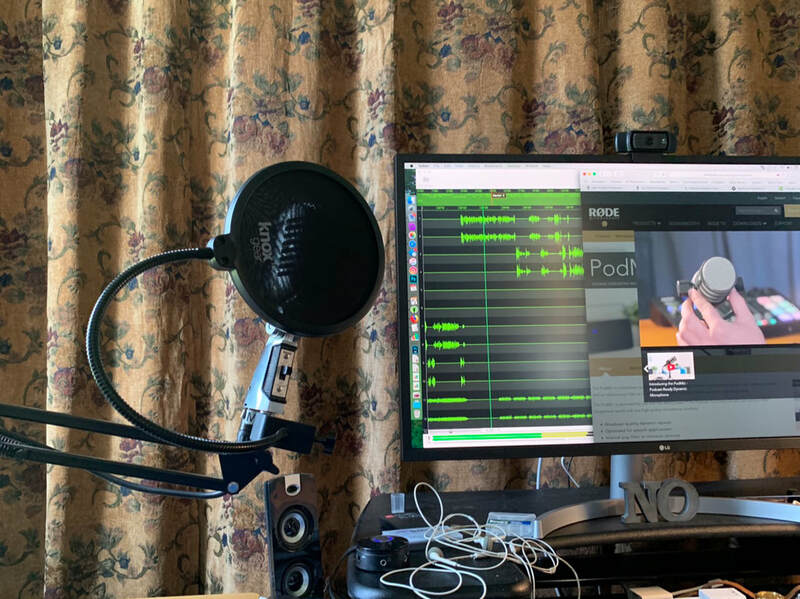 There are a number of ways to record a podcast and, of course, this depends on whether you’re doing audio-only or video. For audio-only this is relatively easy but you’ll want the highest quality recording your budget will allow. Audio quality is a big factor, to me, and I’ve dumped podcasts where the audio is terrible. In my opinion, most people are listening in compromised places such as inside a car or on headphones so the audio has to be good. I recommend buying a high-quality but not overly expensive mic such as the Rode PodMic, which retails for about $100. There are a ridiculous number of choices for microphones but it’s good to get something specifically designed for speech and this one is designed for less-than-ideal recording conditions. Let’s face it, few of us have an elaborate studio. From there you’ll need a way to record the podcast - typically on a computer. You’ll see a computer with specific recording software described as a Digital Audio Workstation, or DAW, in a lot of forums on line. There are a lot of choices for software to accomplish this but one that tends to get good reviews is called Reaper (what a horrible name). Reaper is only $60 for an individual license. Be forewarned, learning to edit audio is a specific talent and there are people who make a career out of it so doing a great job here is something you’ll need to learn. Of course, there’s always the University of YouTube. You’ll also need to hook that mic to a computer. You could go very inexpensively with a Griffin iMic which will certainly do the job connecting a professional microphone to the USB port on your computer. There are also USB mics but I haven’t found one of these I like that much and I’ve spent hundreds on these things only to wind-up with the RØDE PodMic. If you have multiple people in different locations, all using a computer and a microphone (no telephones) you can use an outstanding website to facilitate recording your podcast called Zencastr. I love this website as it allows each person to chime in and hear one another and records a separate track for each person. Furthermore, it records those tracks on the person’s local computer and then uploads that to you so that it can better avoid glitches due to connection issues. You could even theoretically use this with two or more co-hosts in the same location each using Zencastr but on their own computer in different rooms - this is much cheaper than buying a mixer and does a really good job. I’ve recorded with up to three people using Zencastr and have been very happy with the results. Alternately, if you have more than one person in the same place you will very likely need a mixer to accommodate multiple microphones and inputs. I recently bought a RodeCaster Pro mixer which wasn’t cheap, about $600, but this unit allows for up to four mics in one place along with audio from a computer such as with Skype or FaceTime, a sixth audio stream from a phone physically connected to the mixer via a cable and a seventh stream from a phone connected to the computer via BlueTooth. This opens up the doors to my having guests from anywhere. I also know that a lot of people use Apple computers and use the included GarageBand software to record podcasts. That software specifically has podcast functionality built into it since Apple is such a big player in the podcast world. Zencastr on the Internet and the RodeCaster Pro both allow for one audio channel per person. If someone coughs or sneezes or sounds like Darth Vader at the buffet you can mute that channel when you’re editing your podcast so those sounds don’t distract from the finished product. I typically spend about 4-6 hours editing a podcast that results in about 30 minutes of time but I’m very picky about audio quality and I’m still always criticizing my final result. In order to make my audio sound better and less "echoey" I had to hang a giant curtain over one wall of my office. There are a lot of places where people can fall flat on their face or even end-up in court. For example, you should completely forget about music on a podcast altogether unless you can get a local musician to create music for you that is not subject to any copyright. If you use copyrighted songs, even fewer than 30 seconds in length, you can and likely will get sued. Remember podcasts are world-wide so if you don’t have the specific written permission to use a song or portion thereof in any place around the globe, you’re simply asking for trouble. Likewise don’t use sound effects or other audio that may be copyrighted for the same reason. We all think it’s hilarious when Homer Simpson says “D’oah” but know that Fox owns that and their lawyers can beat up your lawyers. Whatever the subject matter is, get to it as quickly as possible. I once listened to a podcast where the host had the most ridiculously long introduction of the guest talking about their accomplishments and such. I actually never heard the podcast as I couldn’t take it after over 3 minutes of introduction. You could have reincarnated Einstein but after that long an intro, I’m done. You can use the end of the podcast, after your audience has bought-in, to tell them about your website and more info about your guest and all of that. Oh, and speaking of websites, yes, you do still need a website for your podcast. That’s where you’ll have show notes, photos, bios, links, advertisements (someone’s got to pay for the podcast, right?) and more. Lastly, if you’re selling, selling, selling you’re not likely to get many listeners. The idea is to provide real information your audience can use. Be entertaining and informative. I also want to make the case for staying clean with the language - we all swear but you’ll open up your audience more if you don’t on the podcast. So there you go. I wish I had known all of this when I started a podcast. I learned quickly, though, and used the usual resources including YouTube to make it happen. I also had to sift through tons of choices of hosts, editing software, microphones, mixers and more. Basically, all the recommendations here are ones I have found zero issues with. Also, as with everything, you’re going to need to market your podcast. There are tons of tricks to this but I hope you’ve been following my Monday Morning Marketing blog as there have been tips in there on how to get the word out. Of course I’m sure you already have a fan base so you will naturally approach them, of course. Right now my own podcast continues to grow and I am tinkering with the idea of turning my Monday Morning Marketing emails into a podcast. I’m also considering recording a third podcast (because I’m nuts) for my RV/camping website. We shall see.